We told you in May that 18-year old Mohammed Hasnath had been identified as the man behind the infamous Gay Free Zone stickers that appeared throughout East London over the early months of 2011. 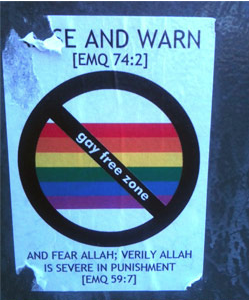 The stickers, which warned that gays will face Allah’s wrath, were illegal under section 5 of the Public Order Act of causing harassment, alarm or distress. They were also incredibly mean-spirited and cruel. But hey, you already knew that. Yesterday, Hasnath had his day in court. Above the flag was printed “Arise and warn” and below it said “And fear Allah: Verily Allah is severe in punishment.” Both were followed by references to the English version of the Koran. “He said this was because in the Koran it was forbidden for any person to be a homosexual and as a practising Muslim it was against his religion,” Mr Watts said. In a statement read to the court Jack Gilbert, a board member of the Sandy Row Synagogue and co chair of the Rainbow Hamlets community forum, said: “For me I read this no differently from a sign that said ‘Jew free zone’. “When I see that sticker I see the signs my mother saw in the 1930s which actually carried less suggestion of punishment. So what punishment fits the crime of “immediate threats of violence” and “deeply upsetting the community,” including those with loved ones killed in the Holocaust? About $150. Hasnath was fined just a measly £100. Keep in mind that these stickers inspired death threats against women who dared to show their hair in East London, and the cancellation of the East London Pride Parade. There’s also the matter of five men being charged with inciting hate speech in the neighborhood for distributing pamphlets calling for the death penalty for gays. The stickers were so much more than just stickers. They were a catalyst for death threats, violence and pure hatred. When told the allegation against him of a public order offence of using threatening or abusive words or behaviour between February 11 and 14 Hasnath said: “But I just put up stickers, I didn’t harass or swear at anybody or anything.” Hasnath, who was representing himself, pleaded guilty to the offence. When asked by District Judge Jeremy Coleman what he had to say for himself Hasnath said: “Basically, some people just handed them to me so I just put them up. I didn’t say anything, it doesn’t say that I am going to punish them it just says what God says in the Koran. We really don’t understand why the judge didn’t throw the book at Hasnath. Perhaps East London’s anti-gay problem goes much deeper than we ever suspected.